Senior Syracuse University midfielder JoJo Marasco drives to the net against sophomore Duke University goalie Kyle Turri. 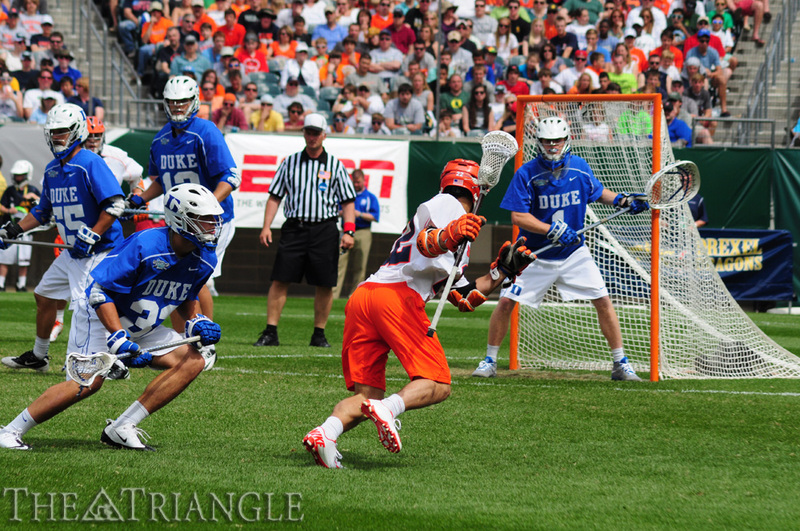 Duke won the 2013 NCAA Men’s Lacrosse Championship. Sports teams are often compared to cars. It is certainly not a surprising phenomenon, considering the growth in popularity of sports coinciding with the growth of the automobile industry in the United States. Analysts, coaches and fans throw around terminology like “well-oiled machine” and “firing on all cylinders” from time to time as appropriate accolades for dominant teams and dominating performances. Now, picture a championship lacrosse team as a 1967 Shelby Mustang GT500, considered to be one of the most highly regarded muscle cars of all time. The attack and the midfield are its back wheels, driving the high-powered team toward its goal. The defense and the coaching staff are the front wheels, holding the powerful machine steady while guiding the team in the right direction. But the goalie is the engine. Without a superior engine, such as the V-8 of the Mustang, the automobile has no superiority; it is just a nice-looking shell of a car that is not built for the long run. After attending the NCAA Division I semifinals May 25 — hosted by Drexel University — it became blatantly obvious that a championship-caliber team needs a championship-caliber goalie to drive it to a title. This was ever so apparent in the matchup between Syracuse University and the University of Denver. In the first half, the Orange absolutely dominated the Pioneers in all but two statistical categories: saves and goals. Although Syracuse held a 15-7 advantage in shots on goal, Denver led 5-2 at halftime thanks to 13 saves — yes, 13 saves — from sophomore goalie Ryan LaPlante. In the second half, Denver head coach Bill Tierney stuck with his team’s seasonlong strategy and replaced “first-half” LaPlante with “second-half” junior Jamie Faus, and Syracuse came back to win by a score of 9-8. Faus saved only four of the Orange’s 11 shots on goal in the second half, although Tierney did not regret the decision. And Tierney is right, in a sense, as both of his goalies had above-average seasons in the cage. Including the semifinal game, LaPlante boasted a .576 save percentage and Faus a .554 mark of his own. But hindsight in coaching decisions aside, the fact remains that LaPlante was the sole reason why the Pioneers had more than a deer’s chance on the Pennsylvania Turnpike of winning the game at all; he truly carried his entire team for 30 minutes. In the other semifinal game between Duke University and Cornell University, solid goalie play was at a minimum, hence the 16-14 final score in favor of the Blue Devils. However, Duke sophomore goalie Kyle Turri was just good enough to put his team over the top and help them advance to the championship game. After the first half ended with the Blue Devils leading the Big Red by a score of 7-6, Duke scored seven goals to open the third quarter and stormed out to a 14-6 lead. Cornell added a tally near the end of the quarter, but by then the damage had been done. Turri was a big part of the hot streak, as he stopped four of five Big Red shots during the third quarter and finished with 16 saves out of 30 shots on goal for the game. Although Turri is no perennial All-American, he played his best under the bright lights. As 28,444 were in attendance at Lincoln Financial Field and thousands more watched on ESPN, he stepped up to the occasion. And even though Turri allowed seven goals on 11 shots in a fourth quarter that almost saw the Big Red make a jaw-dropping comeback, his teammates did not help him out much; the Blue Devils had nine turnovers in the final frame alone. Speaking of turnovers, another noticeable trait of the stellar goalies at the NCAA Division I semifinals was that they were forcing them. No goalie was more active outside of his crease than Syracuse junior Dominic Lamolinara, as he routinely challenged for out-of-bounds possession and attempted to intercept passes close to the net. In the championship game against Duke, Lamolinara fought for a loose ball near the sideline and was body checked out of bounds by a Blue Devil. After seeing that no penalty would be called, he bounced right up and safely scurried back to his crease in a matter of seconds. Having a goalie beat out an offensive player for a ground ball can be very deflating for the opposition. On the contrary, watching your own goalie create a turnover can energize a team to a fast break the other way. In fact, that is just what Cornell senior goalie AJ Fiore did in his game Saturday afternoon. Although he had a poor performance overall — saving only 10 of 26 shots on goal — he kept his head in the game as time winded down. In the middle of the Big Red’s fourth-quarter run, Duke had just scored to extend its lead to 15-12 with just over six minutes remaining. 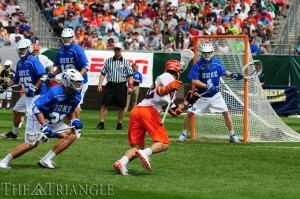 The Blue Devils won possession off the ensuing faceoff and controlled the ball within the Cornell zone. Then, out of nowhere, Fiore left his crease and lunged at a Duke pass intended to go behind the net. He intercepted the pass with one hand on his stick and fed his team the other way. The Big Red scored two consecutive goals to pull within one but ultimately could not notch the tying tally. Blue Devils head coach John Danowski had the following praise for Turri after his team’s 16-10 championship victory over Syracuse: “He makes plays, intercepts passes, picks up ground balls, has got great touch in the clearing game, and he does more than just stop the ball.” This rings true for any lacrosse goalie aspiring to make a difference. That is easier said than done, of course, especially when a heavy rubber ball is flying at your seemingly unprotected body at speeds nearing 100 miles per hour. But that is the game, and that is what these brave individuals have signed up for. But lacrosse is a funny sport. It is a sport of speed, physicality and excessive amounts of face paint. In a sport where teams routinely score 10 goals per game — sometimes nearing 20 — a goalie who saves only half the shots he faces can be the hero. Because when a team is “firing on all cylinders,” there is usually only one player who can stop his team from being the roadkill of a Mustang: the goalie.